redlinegti.com • View topic - New Swift (2005+ model) owners introduce yourself here! Post subject: New Swift (2005+ model) owners introduce yourself here! With the influx of new Swift owners on the rise, and so many threads popping up with people wanting to show off their cars, I thought it would be a good idea to start a sticky thread for newbies to announce themselves. So, tell us about yourself, your new Swift, and how you found the site. Oh, and welcome to RedlineGTi! Last edited by [YLD80Y] on Thu Feb 09, 2006 9:12 am, edited 1 time in total. Hi all, im new to the site and what a great site it is i must say. I have a silky silver manual swift with cruise and 16x6.5 Titanium alloys (legal). Bought it in july '05. Havent done anything to it as yet but wish to lower it and give it a sports exhaust. A turbo would be good but trying to justify the price it is hard to get my head around as i would imagine it would cost almost half the price of the car itself. Ive done about 9000k in it so far and must say its a great car, you get plenty of looks and other people with a swift always coment on how do find it. I have read these posts on dwdaves turbo swift but nothing has been posted about price of installing a turbo and all the bits and im sure someone has asked. Maybe supercharging could be a better way to go although it aint cheap either although what performance is cheap if it good. The thought of the turbo with a nice blow off valve would be awesome though. Last edited by DSWIFT_2U on Wed Jul 05, 2006 8:48 pm, edited 2 times in total. I am a New Suzuki Swift owner as of about 2 weeks ago. My previous car was a Suzuki Ignis Sport, kinda miss it though. Just fell across this site while i was looking for information on the proposed New Swift Sport and GTi. I got my 05 Swift (Bert) in December and he has already done 6k km and is still going strong! Although he is stock-as-a-rock, i love him and have a few plans! hehe. Can't wait to start on my little project, just trying to wear him in at the moment, but i hope to be starting soon! I'll be sure to keep you all posted! Hey, the missus and I just purchased a brand new bluish black Suzuki Swift, due any day now. A few things will be done to it when it arrives, but not too much, we got this as one car to save money for our wedding! Ok time for the oldies! My swift is the silky silver colour. Stock as rock! Bought in march 2005. Front headlight protectors, mud flaps, floor mats, rear spoiler, tinted windows, alarm upgrade. no mods done as yet other then the head lights (4000k Phillips). *17x7 wheels but thinking of 18" too. Hi all my names Brien. I took hold of my swift just b4 xmas 2005.
paid $18.000 even bourght stock modle but had them fit spot lights to it and i got the alloy pedel kit plus mats for free. the day b4 i got it i went to mag wheel and tyer center and ordered my 17x7 alloys witch are advanti scud usa series with hankook 215/40/17 tyers. I then ordered king springs for it witch i think it needed just to set of the wheels. ive also added new front speakers witch are MB Quarts reference series 6 1/2 inch plus soundstream spl's 6 1/2 inch in the rear doors. Ive got 2 12 inch phinixgold x max carbon fiber subs and three amps so far ...2 are phinixgold xs2500 series and the other is a ppi sadona series. Ive also got a phinixgold bass cube , a lightening audio 1 farad cap,phinix gold cuircuit bracker mounted ontop of the battery. other add on's will be a new sub box witch is 1/2 designed and will be a fibber glass item....and i wish to fit the suzuki sport stainless steel muffler from japan as well once i find a supplier for it in aussy land,and iether a pair of recaros or sparcos in the front, would consider fitting a power chip once my warrenty is over and stiffer shcks as i think the standard items are just too soft....ohh yes and a sunroof apart form that, that will be it as i am just starting a new mini project soon so i plan to concertrate on this. 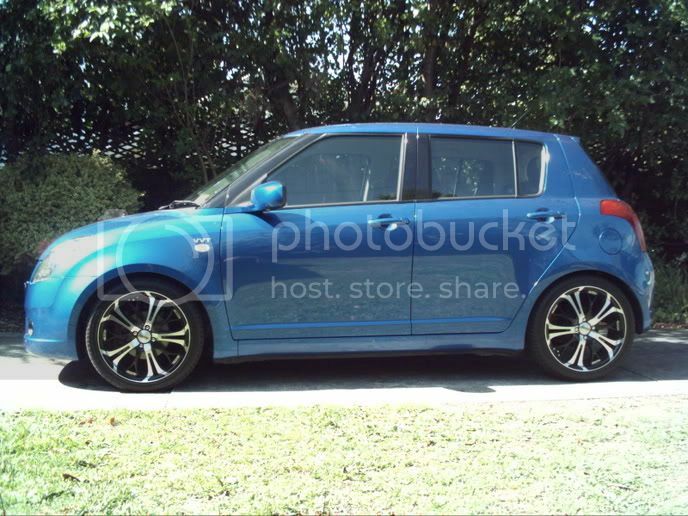 cant wait to go to some suzuki swift cruises in melbourne and see what other people have done to there cars. hey minifreak i am taking delivery of my new swift next week(suposedly) but am set on 17s but really am afraid that if i get king springs it will scrub the tyres all the time, i just wanted to know what yours is like even with 2 people in back? if you are concerned just by the springs and fit them and see ...you can allways ring up king springs and order a custom set for the rear say 25mm lower not 30?? ?this is what im considering doing if i cant make a sub box witch is light enough for the boot.suzukisport in japan sell lower spring 20 mm low ?? ?there listed on there site. good luck...hope you get them...as after a little rubbinghere and there the look is fantastic once they are lowered. Swifty_NZ. Azure [Gunmetal] grey. Bought 'er mid-2005 immediately after first seeing Suzuki's TV ad. - A tiny ding in the drivers door which pi$$es me off every time I look at it! - paintless dent removal of annoying ding in door! minifreak would it help if you rolled the guards would that stop the rubbing ,cos isnt that what a lot of lowered cars get done? You need to be carefull you get that done at. I got it done on my starlet and the paint was cracked under the panel. before i sold it i realised that there was rust building up wher the cracks where. You can even do it.. get a rubber hammer and slowly roll it in. Bt as i said go to a good panel beater to do it. My mates swift got the guards rolled and the paint cracked. but im sure if i went over a huge hole at some stuppid speed it may bottom out?? ?bottom line fitting kings springs lowered items is ok...if you dont have any serious weight in the car it wont hit guards.